Ziel der Studie Erfassung der Nutzungsakzeptanz, Zugangsmöglichkeiten und -barrieren eines Online-Selbstmanagementprogramms (moodgym) für Depressionen. Methodik Schriftliche Befragungen von n = 181 stationär behandelten Patienten (Prä-Post-Messung, 8 Wochen) und n = 31 Experten. Ergebnisse Moderate bis hohe Nutzungsakzeptanz. Relevante Zugangsbarrieren waren geringe PC-Erfahrungen, Konzentrationsschwierigkeiten und schwere Krankheitsverläufe. Schlussfolgerung Erstmals konnte gezeigt werden, dass Interventionen wie moodgym einen komplementären Behandlungsbaustein in der stationären Versorgung bilden könnten. Objective The study aims to assess the acceptance, chances and barriers of an online self-management program (moodgym) for depression from the perspective of experts and patients in inpatient psychiatric settings. Methods Paper-pencil interviews were conducted with n = 181 depressed inpatients (n = 181, pre-post-assessment after 8 weeks) and n = 31 medical experts. Two regression models were carried out to investigate factors associated with the uptake and the user acceptance of moodgym. Chances and barriers were analysed qualitatively. Results Experts and patients reported moderate to high user acceptance. 59 % (n = 107) of the patients logged in to moodgym. Factors associated with the uptake were the educational level and treatment preferences. The user acceptance was influenced by the patients’ self-rated health and the frequency of using moodgym. Relevant barriers anticipated by experts were limited computer skills, difficulties in concentration and a severe course of depression. Patients highlighted the ease of use, the moodgym characters and the flexible availability. Conclusions moodgym may represent a complementary treatment option for depressive disorders in an inpatient setting. 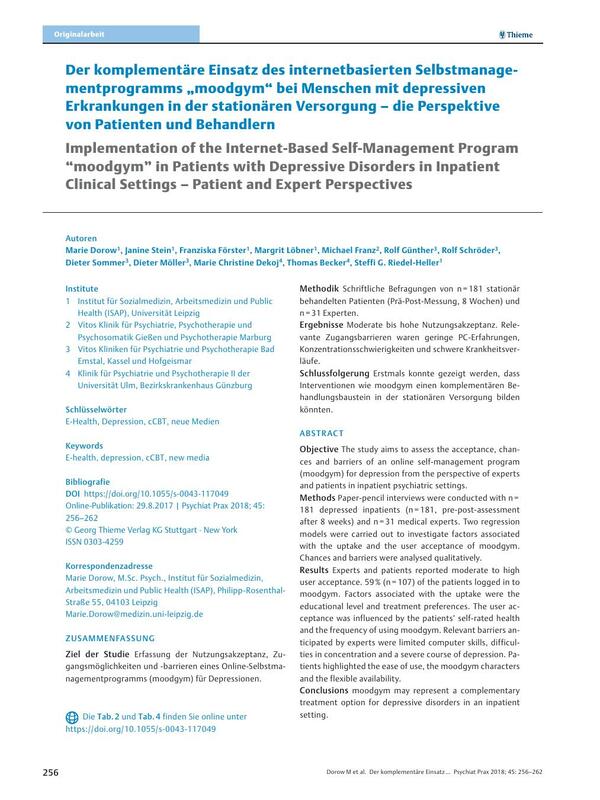 14 Eichenberg C, Wolters C, Brähler E. The internet as a mental health advisor in Germany – results of a national survey. PLoS One DOI: 10.1371/journal.pone.0079206. 22 Burns MN, Begale M, Duffecy J. et al. Harnessing context sensing to develop a mobile intervention for depression. J Med Internet Res DOI: 10.2196/jmir.1838. 23 Danaher BG, Milgrom J, Seeley JR. et al. MomMoodBooster web-based intervention for postpartum depression: feasibility trial results. J Med Internet Res DOI: 10.2196/jmir.2876. 32 Löbner M, Stein J, Rost T. et al. Innovative E-Health-Ansätze für komorbide Depressionen bei Patienten mit Adipositas: Nutzungsakzeptanz aus Patienten- und Expertenperspektive. Psychiat Prax DOI: 10.1055/s-0043-107471. 35 Knowles SE, Lovell K, Bower P. et al. Patient experience of computerised therapy for depression in primary care. BMJ Open DOI: 10.1136/bmjopen-2015-008581. 36 Høifødt RS, Lillevoll KR, Griffiths KM. et al. The clinical effectiveness of web-based cognitive behavioral therapy with face-to-face therapist support for depressed primary care patients: randomized controlled trial. J Med Internet Res DOI: 10.2196/jmir.2714.